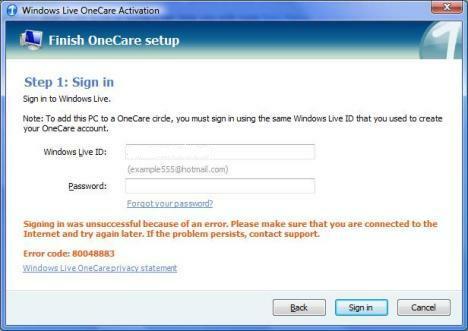 When trying to activate Windows Live OneCare after a successful installation, the activation process may fails during the finishing Live OneCare setup to sign in with Windows Live ID. The error message saying that “signing in was unsuccessful because of an error. Please make sure that you are connected to the Internet and try again later. If the problem persists, contact support.” even though the user ID and password is correct. The error code is 80048883. The unable to connect to Microsoft’s Windows Live server error occurs probably due to connection been blocked when trying to establish the connection, caused by invalid, incorrect or corrupted SSL certificate or tighten security for non-Trusted Internet sites. When activating Windows Live OneCare program, the software attempts to connect and communicate with activation web service which located at iorigin.onecare.live.com. The URL or domain suffix for activation service is different from the typical popularly used standard Live sites at live.com or OneCare product page at onecare.live.com. Once done, try to sign in to Windows Live to complete the OneCare activation setup again.